Eric Schmidt (b. Eric Emerson Schmidt April 27, 1955) is an American businessman, software engineer, and the executive chairman of Google. Forbes ranked Eric Schmidt as one of the 200 richest people in the world, with an approximate wealth of more than $8 billion. Eric Schmidt was the co-author of Lex, an analysis software program used in the Unix operating system. He also acted as chief executive officer for technology firm Novell from 1997-2001. 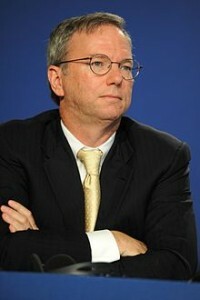 From 2001 to 2011, Eric Schmidt was the chief executive officer of Google. Eric Schmidt has previously served as a member of the board of directors for Apple, Inc. He sat on the boards of trustees for Princeton University and Carnegie Mellon University. Schmidt was born in Washington D.C., one of three sons of Wilson and Eleanor Schmidt. He spent his youth in the Virginia cities of Blackburg and Falls Church. In 1972, Schmidt graduated from Yorktown High School, located in Arlington, Virginia, located in 1972. He eventually received a bachelor’s degree in electrical engineering from Princeton University. Schmidt earned a master’s degree at the University of California – Berkeley in 1979. There, he designed a computer network that was then implemented by numerous campus departments. In June of 1980, Eric Schmidt married Wendy Boyle. The couple separated in 2011. They have two daughters, Allison and Sophie. Schmidt is currently dating Chau-Giang Nguyen, a concert pianist. After completing his master’s degree at the University of California – Berkeley, Eric Schmidt continued his education by pursuing a Ph.D. degree. He achieved this goal in 1982 with a dissertation outlining the important issues of managing software development while recommending tools that could assist in alleviating problems. During his doctoral study, he was also a co-author at the software lexical analyzer Bell Labs of Lex. In the early stages of his career, Eric Schmidt worked in a variety of technical positions with major IT companies. These companies included Zilog, Bell Labs, Byzromotti and Xerox (Palo Alto Research Center). Eric Schmidt became the first software manager at Sun Microsystems in 1983. He eventually rose through the ranks to become the president of Sun Technology Enterprises. Prior to this position, he served as director of software engineering, vice president of general systems, and vice president and general manager of software products. Schmidt was asked to be a lecturer at the Stanford Graduate School of Business in the 2000s, and he focused primarily on the area of strategic management. Eric Schmidt established the Schmidt Family Foundation in 2006 to address key issues of natural resources and sustainability. In partnership with Heart Howerton, an architectural firm based in San Francisco, Schmidt developed numerous projects on Nantucket that were aimed at minimizing the effect of seasonal visitation on the island. In 2007, Eric Schmidt was ranked first on a PC World list of the most important people on the Internet, along with co-founders of Google, Sergey Brin and Larry Page. The advisory agency Brendan Wood International named Eric Schmidt as one of the TopGun CEOs in 2009. Schmidt was a major donor and advisor to Barack Obama’s presidential campaign during the 2008 election cycle. After Obama was elected to the presidency, Schmidt joined Obama’s transition advisory board to champion renewable energy as a replacement for fossil fuels. Since then, he has become a valued member of PCAST (President’s Council of Advisors on Science and Technology).